It may have been overlooked at the Oscars, but Steven Spielberg’s big-screen adaption of a 1940s series of European comic books may just be the best animated feature of the year, says Fernando Caire. I never read the original Tintin comics. Nor have I seen the original cartoons. From what I can gather, they’re about a young detective who solves crimes, goes on adventures, gets into fist fights with grown men, and carries a gun. Sounds pretty awesome, right? But while the plot probably wouldn’t fly today (children with guns? Frowned upon) Steven Spielberg’s first animated feature succeeds in bringing an old character to the new age with some of the most impressive CGI I have ever seen. Not that you’d know that from the opening sequence. In fact, I haven’t seen an introduction this misleading since Indiana Jones and the Temple of Doom. The music is boring, the animation is flat (literally: it’s 2D), and I had no idea what was really happening. Whereas an opening scene should set the tone for the rest of the film, this one felt completely divorced from the rest of the movie. Fortunately, things get better from there on, as boy reporter Tintin (Jamie Bell) comes into possession of a model ship that is much more than it appears to be. With the sinister Sakharine (Daniel Craig) willing to resort to kidnapping and even murder to retrieve it from him, Tintin must discover the secret of The Unicorn in order to stay alive. The journey will take him halfway around the globe, accompanied by Snowy, his canine companion, and Captain Haddock (Andy Serkis): an alcoholic sea captain who holds the key to the riddle of the ship. You don’t get tales of adventure like this nowadays. And then there’s the talent involved. A John Williams score? Check. A Steven Moffat and Edgar Wright screenplay? Check. Nick Frost and Simon Pegg being their usual, awesome, selves as detectives Thompson and Thomson? Double check. How could this possibly go wrong? It doesn’t. Not quite, anyway. The movie is a thrill ride from start to finish, but it isn’t perfect. 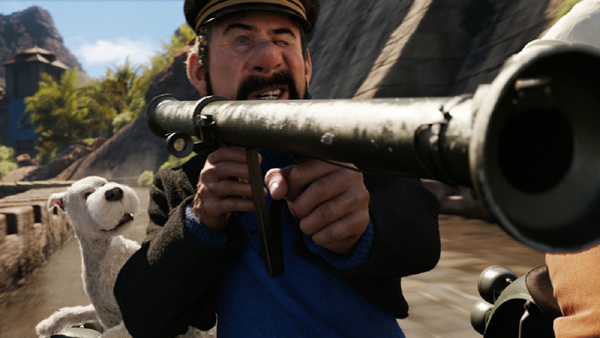 Though Andy Serkis outdoes himself with the voice acting, Captain Haddock is very much the comic relief in this movie, and quickly becomes more irritating than endearing. There is also a problem with pacing. The action is intense and spectacular, but sometimes scenes that are meant to be suspenseful or comedic get drawn out way too long. But the visuals are second to none. Many movies have tried for this realistic-yet-stylized look, but where Beowulf, Mars Needs Moms and The Polar Express failed, Tintin succeeds. This is the first film I have ever seen where I had to stop the movie, rewind, and re-watch a scene because it looked far too realistic for its own good. In fact, I ended up doing it three times. The animators at Weta Digital have raised the bar on performance-captured animation yet again, making the movie a treat to watch in high definition. The Blu-ray release provides a ton of juicy extras, most of them providing an insight into how Spielberg came to be involved. I really enjoyed the behind-the-scenes tale of how two creative powerhouses – Spielberg and producer Peter Jackson – came together to bring a mutual love to the screen. There are a ton of other interviews with the producers, writers and cast, and after watching them, it is hard not to appreciate both the source material and the vast amount of work that went into the final production. There is also an amusing bit of test footage from when Tintin was planned as a live-action movie, with Peter Jackson playing Captain Haddock. As a bonus, you get an extra copy of the movie in DVD format, plus a digital copy to download. My only gripe is that there isn’t more insight into the animation process. Plenty of time is spent focusing on the motion-capture technology, but we are hardly shown how Weta managed to make such a beautiful film. The lack of Weta fan service aside, this is a release in which the good far outweighs the bad. Spielberg and Jackson’s love of the source material clearly shows through, and – a few hiccups in pacing and some dated slapstick humor aside – the film is a lot of fun to watch. 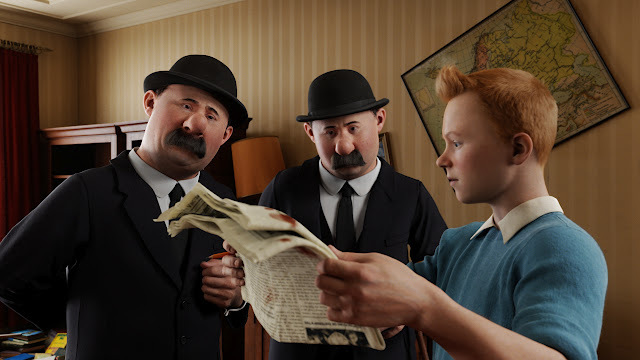 Given the people involved in it, you could argue that it’s merely good when it should have been great, but despite this, I can easily say that The Adventures of Tintin is my favorite animated film of 2011 – if only for those amazing visuals. 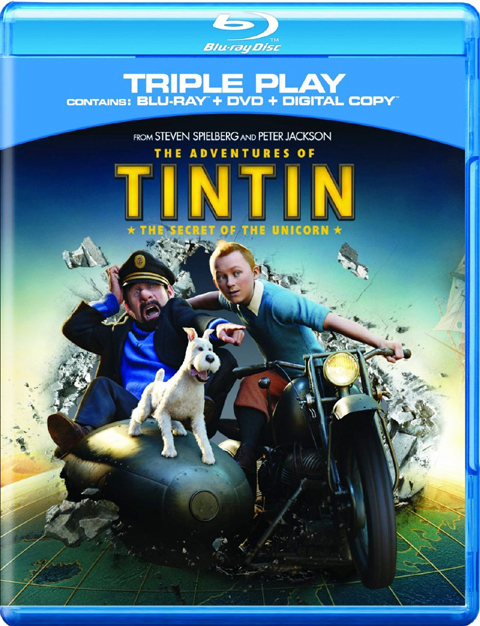 The Adventures of Tintin is released on Blu-ray and DVD in North America on 13 March 2012, and worldwide later in the month. Fittingly for a French-language institution, the Blu-ray is already available in France.